Strong, stable and ultra-sleek, our newest 7-shelf storage solution holds over 160 bottles. Born for pantry and kitchen, it's quality constructed of heavy-duty chrome-plated steel for contemporary good looks and long lasting service. Capacity varies depending on the size and shape of the bottles stored. Simple assembly required. Strong, stable and ultra-sleek, our newest 7-shelf storage solution holds over 160 bottles. Born for pantry and kitchen, it's quality constructed of heavy-duty chrome-plated steel for contemporary good looks and long lasting service. Capacity varies depending on the size and shape of the bottles stored. Simple assembly required. Dimensions: 65" H x 35.5 "W x 14" D, 126 bottles. I have a space 36 inches wide, and 70 inches tall, in which to place a wine rack. The description lists the width of this rack as 35.5 inches. Is that an accurate measurement of the outside width? Thanks. BEST ANSWER: Sorry I took so long to answer but I was out of town and couldn't measure my assembled unit. This unit is actually closer to 35.25 and should fit. This unit assembles from the bottom up rack by rack which should make assembly in place easier than trying to squeeze the completed rack into the small place. I bought one of these racks just to see if I liked the quality. I know have three of them and will be ordering another 3 in the near future. The rack is 35.5 inches wide across all shells and 65 inches tall. You should have no trouble putting it together outside your space and fitting it in. I love the rack. It is very stable. Ours measures 35.25". I used a tape measure and yard stick and both confirmed the above measurement. Hope this helps! This is a great rack and the dimensions are accurate. Are there options to buy additional shelves so you can add more bottles without stacking. If you can't buy shelves separately and just buy two complete racks, is it ok to add more shelves to the one rack? That would bring the space closer together between shelves. Yes, you can add more shelves but you would have to buy a second unit. No, additional shelves are not available. Are the shelves flat or molded to shape of bottles? The shelves are molded so the bottles won't move and they are molded so every other bottle is front to back to make use of maximum space. They are molded to hold the bottles. That is what makes it possible to stack them as the pictures shows. Works very well. The shelves are molded to fit bottles. I have put wooden wine boxes on them. The shelving system works great. The shelves have the shape of holding the bottles. We are very happy with the shelving. Attractive also. Molded to fit the bottles. Very happy with this wine rack. They are molded to the shape of the bottles. Cheers! They are molded to the shape of the bottle. If I were to install the first shelf about 14" up from the floor (the height of a case) and then installed the other 6 shelves evenly spaced above that, do you think it would be too top heavy when fully loaded for safety? (If you think about it... On average, each shelf is positioned a little more than 2 inches higher than it would be if the bottom shelf were lower (14"/6 shelves). Or you might think in terms of the center of gravity being about 7" higher.). Provided the unit is securely fastened too the wall, this shouldn't be a problem. Ours is installed in our basement of our vacation home against a concrete block wall. I used two 1" conduit clamps on the back vertical posts to secure to the wall. This is a very sturdy unit. We're pleased with it. Only downside is that certain size chardonnay bottles do not stack properly. That is exactly how I have my shelves set up. However, mine is in a closet, so I don't have to worry about it being top heavy. Nonetheless, I do not think it would be too top heavy set up the way you describe. To be completely safe, you should consider securing it to the wall near the top, or at least load it from the bottom up. I think it would depend on how you distribute the weight on the shelves. If you have a disproporationate weight on the upper shelves, it could make the rack unwieldy. I think that if you load the lower shelves more heavily even if the lowest shelf is higher off the ground, then your rack should remain firm and steady. I don't think you should have a problem, as the shelfs are of a heavy gouge. BUT I wouldn't go much higher. Also if in doubt you could conceal a small piece of strapping screwed into a stud, guaranteeing you stability. Hope this helps. I do think it would be too top heavy. You may be able to do it if the rack is reinforced to the wall, but overall I would say probably too top heavy. It may be, anchor the rack to the wall at top, this would keep the rack from falling. Yes, I do think it might be too top heavy. It works well if you use it as directed. After I assemble the rack, can it be disassembled (to adjust the placement of the shelves)? BEST ANSWER: Yes, they are the same as any metal storage shelve but you may have to take all the bottles off depending on which shelf you want to adjust or just for safety reasons. You typically have to hit the shelf fairly hard to get it to dislodge from the black clips. A rubber mallet works well or just a hammer. Yes, the shelves are held in place by plastic sleeves on each upright. You'll need a rubber mallet to first knock the shelf upward. Then you can move the plastic sleeves to the new position and then remount the shelf. Yep the shelves are adjustable. There are plastic collars that lock into the grooves on the rack uprights and the shelves rest on those. Once assembled, the pantry wine rack can be taken apart for adjustment of any of the shelves. Yes you can but have to removal all the bottles above the shelves you want to move. YEpisode. I just did that. No problems. Yes shelves are adjustable as needed. 35" wide by 65.5 "high. Very nice product for the money. Does it have optional casters.? 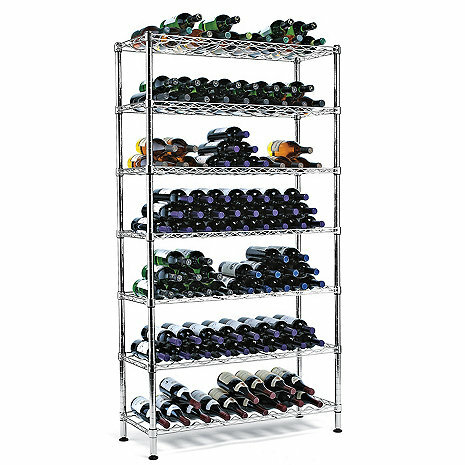 BEST ANSWER: The Steel Pantry Wine Rack (126 Bottles) does not come with casters. I would not recommend you place wheels on this unit as one bottle of wine weighs four pounds and when you have many bottles stack on a rack, it will not be that stable. The rack does not come with casters. Given its size and capacity, I wouldn’t want to try to move this rack around. This one does not ! The picture of these shelves shows one shelf holding three rows of bottles, 24 bottles in total. Unless my math is wrong, that suggests the unit could hold up to 144 bottles (I know this will vary depending on the specific size and shape of each bottle), even without putting anything on the top shelf as is shown. Is the rated capacity just meant as a general guideline, or is it based on the weight capacity of the unit, so putting more than 126 bottles on the shelves would risk the unit collapsing? BEST ANSWER: You can fit more but that is general. When stacking wine bordeaux shaped bottles stacking is much easier and may be more difficult with bottles other than bordeaux shapes. 126 is the recommended amount of bottles. Does the unit come with the hardware to anchor it to the wall? Are there labels to attach t the shelf for bin numbers? BEST ANSWER: Thank you for your question. This particular unit does not have hardware to anchor it to the wall and unfortunately you cannot attach labels to it. Please give us a call with further questions. 1-800-356-8466. This unit does not have anything to attach it to a wall and there are no labels. Instead of 7 shelf, can be 10? and do you sell shelf separately? BEST ANSWER: This wine rack can only accommodate 7 shelves. Additional shelves are not available for purchase separately. Can I install/build it with fewer than 7 shelves? I want to store some additional bottles (not wine) vertically, so I would like to have fewer shelves to accommodate the height of those bottles. BEST ANSWER: You do not have to install all shelves, however it is recommended that you do so it will be completely stable. The shleves are contoured so vertical storage is not an option. Are the shelf locations adjustable? No it is not adjustable. Can this be used for champagne bottles? I ask because the Black Tie model only fits bordeaux bottles. We'd like to order another wine rack to house pinot and champagne bottles. Will this model be able to do it? BEST ANSWER: Thank you for your inquiry. Yes, the Steel Pantry Wine Rack will accomodate Champagne bottles. If you have any further questions, feel free to reach out to us at 800 356 8466. Thank you again. Yes the Steel Pantry Wine Rack can be used to rack champagne bottles. The shape of the bottles will govern how many the rack will hold. The more rounded bottles can only be stacked to two layers by reversing the second tier of bottles on each shelf. A third stack is impossible except for bottles with no taper. This diminishes the storage capacity significantly. Most of us don't shop for wine by bottle shape! I use the rack in a basement storage room, where the appearance is not an issue. I would only recommend this product if you can live with the above restrictions. Can put 24 bottles per shelf; this will make 168 per unit. Catalog description says 126 bottles, another place states 160 which is very close to the 168 I could fit on the unit but keep mine around 150 to 155 per unit. Multiple bottle sizes are okay if you keep simialr bottles stacked together. 9 bottles on first row, 8 bottles on second row and 7 bottles on third row. I am very happy with this solution. Arrived quickly and was easy to assemble as I have worked with these types of shelves in the past. Holds plenty of wine easily and is most secure when it is against a wall, but sturdy by itself. Would recommend this for short to mid term storage of wine. Works great if you want to keep 4+ bottles of the same wine together. Worst thing now is that when a space is empty I feel compelled to buy more to fill it again. This was great. We replaced our wooden wine rack with this one. Easy to assemble. Make sure you read the clips because they have the "up" side labelled so you don't have place these things by trial and error. Originally I bought this because I needed something to house my wine samples for work. It fit perfectly in the space I have and fit well with my decor. It was easy to put together alone and holds bottles of different shapes and sizes. Perfect for my needs as I have various size bottles (champagne, pinot noir, burgundy, RhÃ´ne, cabernet) that I want to store. This reduces the total bottle count, but storing the larger bottles is so easy. Easy to assemble. I have 159 bottles on this rack. Hope it holds! It would be nice to have 1 more shelf so the others aren't so heavy. Perfect wine rack for my needs! This rack is very versatile and enables you to make the shelves as tall as you like. If it is used in an open space versus in a small pantry or closet, it should be attached to the wall securely. Steel Pantry Wine Rack-MUST HAVE ITEM! Love this wine rack. You will too - it's sturdy, easy to assemble, attractive and just so practical! This is a "Must Have" item!! We Absolutely Love this Wine Rack!! We now have 3 of them. They are Really Sturdy, and hold 14+ cases of wine, per Rack. They're also really easy to assemble, and can be leveled quite easily as well. I keep my wine in the basement and this is perfect for my purposes. It is sturdy, secure, clean design and high capacity storage. Some Bordeaux style bottles don't fit as well but they fit. This is a great value for the money. I use it in my wine cellar, but it is attractive enough to be displaced more prominently, if desired. It is functional and looks good. I did not assemble it myself, and therefore cannot comment on how easy or difficult it is to assemble. The rack is easy to assemble, holds as many bottles as you can stack and is sturdy. Just wish I hadn’t paid such a ridiculous shipping fee. No wonder Amazon rules. Great Wine Rack for the Money! Love this wine rack! Looks great in our new wine cellar, which is converted storage space under the stairway. This rack hold a lot of bottles,probably more than we need. We are average wine consumers but when we find something we enjoy, we are likely to purchase a case. This rack is a perfect solution in our designated wine celler area in the basement. This is nearly perfect in what we needed to store wines bought by the case. We like the capacity, convenience and efficient use of space. We use identical shelving for long term storage that has held weight for years. We expect the same for storing several cases of wine in this shelving configuration. Two people can assemble very easily. One person was a little trickier but doable, just took more time. Very prompt delivery. Product was is great condition. Exactly as pictured and just what I was looking for at a reasonable price. Very useful to organize my wine. Steel shelving for overflow wine. I have 2 Eurocave Conforts, but always seem to have excess inventory, this takes care of the overflow. Holds a lot and is quite sturdy. Love it..assemble easy and it has great storage. Recommended highly.. It is affordable and very flexible for storing and locating your wine. nice sturdy metal wine rack, very adjustable. Personally would like more shelves instead of stacking wine bottles. it works great for my wine storeage needs. Nothing 2 look at, but relatively inexpensive storage. This is my 3rd one - 'nuff said. Very functional and easy to assemble. Would definitely buy another if need additional, non-refrigerated storage. I was looking for a way to get all those boxes and bottles off the floor. This rack has done exactly that. The only real problem is, that by organizing the cellar, I realize that I need another one, if I want to store everything I have (or want). I suppose one must be careful what one wishes for? Good product, but . . . I bought this rack because the others I've got won't hold large-diameter Burgundy-style bottles. The problem with this rack is that, to reach full capacity you have to stack the bottles, and Burgundy-style bottles don't stack very well. I had to arrange them in alternate front-to-back rows, and they're still not as secure as I'd like. I think this rack would work much better with Bordeaux-style bottles, as shown in the photo. If that had been my purpose, I'd say it's an excellent product, very cost-effective for the price. So recommended with that caveat. Ideally suited for Bordeaux-style bottles, Burgundy style bottles can slip out if stacked on one another. If you stack Burgundy bottles on this shelf unit you need to put them on top Bordeaux-style bottles, which is not very functional. Easy to assemble, looks good and fit our needs very well! Would recommend for storage in a hidden area or where visible by guests. Helped with managing wine storage in a space-limited area. My husband was pleased with the amount of wine the rack held. While it wasn't difficult to assemble, it wasn't just a few snaps and it was ready to go. A second unit would be easier to assemble now that we know what we're doing. The rack is just what I need for out of sight storage. It was well packed and sturdy. A little more tedious to assemble than I would have liked. The wine rack arrived quickly and the box was undamaged. However, when we unpacked it, one of the shelves was severely bent. It was impossible to bend back, thus I contacted customer service. They promptly shipped me a replacement. Very happy and will order from Wine Enthusiast again! Sturdy and attractive wine rack is perfect for our cold cellar. We can now buy wine by the case and store it safely and easily, lying down in the coolness of our cellar before bringing the bottles upstairs to our wine refrigerator. Only minor drawback was that two people are required to assemble the rack easily. Absolutely no help with assembly. Had I not purchased two three shelf units apparently manufactured by the same company a few weeks earlier (both came with instructions re assembly) I would have had considerable difficulty putting the unit together. Everything arrived on time as promised and was very easy to assemble. This is the type of wine storage system that goes in a back room, not on display. It is very sturdy and efficient but not meant to be furniture. It's exactly what I was looking for at a fraction of the price of other display wine racks. Especially economical when on sale. This is the second rack we've purchased. They are sturdy and assemble very easily. Not particularly attractive, or 5 star all the way. Sturdy. Well made. Great value for a wine rack. I keep our wine in the basement on these racks. They are great. My only complaint, and it concerns all racks, no one makes a rack where you can double stack pinot noir bottles safely. Nice Rack but damage during shipment may occur! The Storage Rack is nice and just like shown in the pictures. The unit arrived with two of the shelves bent during shipping. Just be forewarned that the the shipment packaging lends itself to damage. In my case I was able to bent the shelves straight enough to make them usable but your luck may vary. Interestingly the shipment box was not damaged externally else I would have returned it. The wine rack works and it's very appropriate from my basement location. A high rating if the assembly process were easier as each rack does not sit properly on spacing fixtures. helped me organize my tight space.